Several humoral immune factors are responsible for a successful pregnancy. There are a few studies, which demonstrate the role of antipaternal cytotoxic antibodies (APCA) and mixed lymphocyte reaction blocking factor (MLR-Bf) in the maintenance of pregnancy. However, these factors have not been studied in women with history of recurrent spontaneous abortion (RSA). We designed this study to review the role of APCA and MLR-Bf in normal pregnancy as well as in women with a history of RSA. One hundred and five women with unexplained recurrent spontaneous abortion were included in the present study. These women were screened for all other known causes of recurrent abortion. We also included 60 normal fertile women, fifteen from each trimester and fifteen women during the post partum period (up to six months). RSA and controls (normal pregnancy) were matched for age, caste, and socio economic background and also for parity. APCA and MLR-Bf were evaluated in all the groups. All women with RSA who conceived during the study period were on follow up. We have analyzed the status of APCA and MLR-Bf in normal pregnancy (different gestational periods and during post partum), and in women with history of RSA. Our results show that APCA was significantly higher in controls as compared to RSA women. MLR-Bf was directed against the husbands' cells in normal pregnancy and was virtually absent in RSA women. Our results indicate that there is a significantly low titer of APCA and MLR-Bf in women with recurrent spontaneous abortion. This highlights the role of these factors in the maintenance of successful pregnancy. The foetus is a semi allograft as it contains 50% of the MHC genes from the father. It is potentially recognized as an alien and consequently rejected by the mother. Nevertheless, it is carried to term in normal pregnancy. Several investigators have proposed that tolerance to foetal alloantigens are responsible for the maintenance of pregnancy and its failure leads to recurrent spontaneous abortion (RSA). Active induction of tolerance is probably mediated by anti-paternal cytotoxic antibodies (APCA)  and immunologically specific mixed lymphocyte reaction blocking factor (MLR-Bf) . However, various studies on humoral markers in women with RSA have yielded contradictory results. No single immunological marker has been found to be of diagnostic or prognostic value in RSA. In the present study both these parameters viz., APCA and MLR-Bf have been investigated in normal fertile women during different trimesters of pregnancy and post-delivery and in RSA women. It was seen that the level of APCA and MLR-Bf were significantly low in women with RSA as compared to those with normal pregnancy. Quantitative evaluation of these parameters may serve as a marker for identification of women with RSA who may be benefited by immunization against their husband's lymphocytes. Two hundred and five RSA women with history of 3 or more consecutive abortions attending the genetics OPD (Out Door Patients) from March 1996 to July 2001 were included in the study. 149 were primary aborters with more then 3 subsequent foetal losses and 56 were secondary aborters. As per the study design, all these women were investigated to exclude the known cause of RSA (serological tests for toxoplasma, glucose tolerance test, hysterosalpingogram, thyroid function test, luteal phase plasma progesterone assay, anticardiolipin antibody, antiphospholipid antibody, antinuclear antibody test and chromosomal abnormalities of both husband and wife). One hundred and five women who were negative for all the above tests and also not lost to follow up during these investigations were investigated for APCA and MLR-Bf. In RSA women the APCA and MLR-Bf tests were performed within one month of the abortion. Some of these women conceived during follow up. The APCA and MLR-Bf was again tested as soon as the pregnancy was confirmed. The control group included 60 normal fertile women, 15 each in all the three trimesters of pregnancy and 15 in the post-partum period upto 6 months after delivery. Women of control group i.e. only those women who had 3 or more living children were considered. Anti-paternal cytotoxic antibodies were detected using National Institute of Health (NIH) protocol. Serial dilution of maternal serum from 1:2 to 1: 64 was cross-matched with the paternal blood lymphocytes at three different temperature (i.e. 4°C, 22°C and 37°C). This was done as some of the antibodies are activated at 4°C (cold antibodies), some at 37°C (warm antibodies) while others are activated at room temperature. Cross match was done against both T and B cells. A positive result was recorded when more than 80–100% cell death was observed. The mixed lymphocyte reaction-blocking factor (MLR-Bf) was investigated in one-way MLR with cells from the spouse and also against any other unrelated male. Blood was collected under sterile conditions, and peripheral blood mononuclear cells (PBMC) were isolated from heparinized whole blood by density gradient centrifugation on ficoll-hypaque gradient. Cells were adjusted to 5 × 105/ml and were divided into two halves. One half was irradiated (1250 rad), and the irradiated cells were used as stimulators. The non-irradiated cells were used as responders. Cultures were set up in triplicate. For measurement of DNA synthesis, cultures were pulsed with 1 μCi/well of [3H] thymidine 18 hrs before harvesting, and the incorporated radioactivity was measured by liquid scintillation counting. where cpm = count per minute, P = Paternal, M = Maternal and MLR = mixed lymphocyte reaction. Prevalence of APCA and MLR-Bf in the study and control groups was analyzed by using Chi-square test and analysis of variance (ANOVA). Prevalence of anti-paternal cytotoxic antibody in 60 normal fertile couples in different gestational periods and 105 women with RSA is as depicted in Table 1. APCA (titer of ≥ 1:16) were present in 46.66% and 33.33% of the samples in the first and second trimesters subsequently. The titer value in third trimester ranged between 1:4 to 1:64, however, there was a sudden rise of APCA titer during postpartum period of pregnancy i.e. 1:64 to 1:256. In RSA women immediately after abortion APCA was present only in 8.57% samples (titer value ranged between 1:2 to 1:4). We also analyzed the APCA titer in 60 RSA women who became pregnant during follow up and found that the APCA positivity was seen in only 6.66% women and the titer value ranged 1:2 to 1:4. The difference of APCA titer between normal pregnancy and women with RSA was highly significant (p < 0.001). The lowest dilution at which 80 – 100% cells were found to be dead was 1:2. Hence, the cut off limit was taken as 1:2. It is interesting to note that the maximum titer (1:256) was seen one-month post delivery after which it declined to 1:2. Anti paternal cytotoxic antibody (APCA) in couples with Normal fertility compared towomen with RSA. From table 2 it is evident that stimulation index (SI) values in wife serum (WS) were less than in pooled human serum (PHS) in all the trimesters of pregnancy in normal fertile women which is statistically significant (P < 0.001), though this difference was less marked in the post-partum period (P < 0.05). However, in two groups of RSA women (i.e. RSA women with one month of post abortion and RSA women with 1 – 3 month of pregnancy) the SI was almost similar in PHS or WS. In normal pregnancy, three gestational periods i.e. 1st, 2nd, 3rd, trimester and 1 – 6 months post partum were compared with one another. Our results (Table 2) demonstrated that there was depressed SI in the 1st trimester while it increased gradually in 2nd, 3rd and post delivery period. To find out whether blocking activity was specific to the husband's cells or not we used ANOVA followed by logistic regression analysis on the data obtained from all the possible combinations in the mixed lymphocyte reaction experiments (1:2, 1:3, 1:4, 2:1, 2:3, 2:4, 3:1, 3:2, 3:4, 4:1, 4:2, 4:3) on normal pregnant and RSA women. Number 1 is for RSA women, 2 for husband of RSA women, 3 for normal pregnant women and 4 for husband of normal pregnant women. It is evident from the odds ratios (Figure 1) that the blocking activity present in the normal pregnancy is directed only against the husband's cells and not against the cells of the controls. To show the significance of this observation F statistics was applied which revealed that husband's and wife's cells were least proliferated in the wife serum as compared to all other combinations of normal pregnancy group (F= 8.2853, p < 0.001). In RSA women there was no difference in the proliferation in any of the possible combinations (F = 3.54, p > 0.05) indicating that MLR-Bf is absent in this group. This study deals with the alloimmune mechanisms involved in the maintenance of pregnancy. Several humoral immune factors have been implicated to play a role in maternal immuno-modulation but their significance is controversial. Great deal of doubt and confusion exists regarding the choice of a marker for evaluating efficacy of immunotherapy for treatment of RSA. Anti-paternal cytotoxic antibodies (APCA) and mixed lymphocyte reaction-blocking factor (MLR-Bf) are the commonly used parameters [3, 4]. Anti-idiotypic antibody (AB2)  and human embryonic antigen  have also been used as potential markers. In this study, anti-paternal cytotoxic antibodies (APCA) were present in only 8.5% women with RSA. In women with RSA who became pregnant during the study period, APCA was present in 6.66% as compared to 33 – 46% in the control group (p < 0.001). Regan et al. have reported 10% APCA positivity in RSA patients compared to 32% during normal pregnancy. Similarly, Hasegawa et al. have reported less than 8.7% APCA positivity in women with poor pregnancy outcome. Our earlier study has indicated that APCA titer of ≥ 1:16 is a significant predictor of a successful pregnancy outcome following immunization with husband's lymphocytes . Dudley and Branch  have also concluded that development of APCA may be an appropriate marker of maternal recognition of foeto-paternal antigens; however, its absence is of questionable significance as only 20–25% of multiparous women were found to be positive for APCA. On the other hand, Cowchock et al. have totally excluded the role of APCA and MLR-Bf in the prediction of pregnancy outcome. In RSA women APCA titer was either absent or quite low when tested immediately after abortion or a month after abortion. However, in normal pregnancy it was present in adequate titers. Serum factors suppressing mixed lymphocyte reaction were assessed on the basis of stimulation index. In most of the RSA women the SI value in maternal serum was higher as compared to pooled human serum, indicating that the sera of women with RSA do not contain MLR-Bf. Tamura et al  found MLR-blocking antibodies in 82.4% women with normal pregnancy against only 10% in women with RSA. Similar foetoprotective effect of blocking factor has been reported by various other investigators [2, 4, 10–14]. Our study on time-kinetics of MLR-Bf during the course of a successful pregnancy showed maximum levels during the first trimester and a progressive decline through the subsequent trimesters and post-delivery period. However, Tamura et al. have shown that the blocking effect increases with progression of pregnancy. They have also shown that once the blocking factor is formed it is helpful in the subsequent pregnancies. There are other studies, which do not support this hypothesis [15–18]. We have further carried out the regression analysis to find out whether the blocking antibody was directed towards the husband's cells or not. It was found that the blocking factor was specific to husband's cells only. 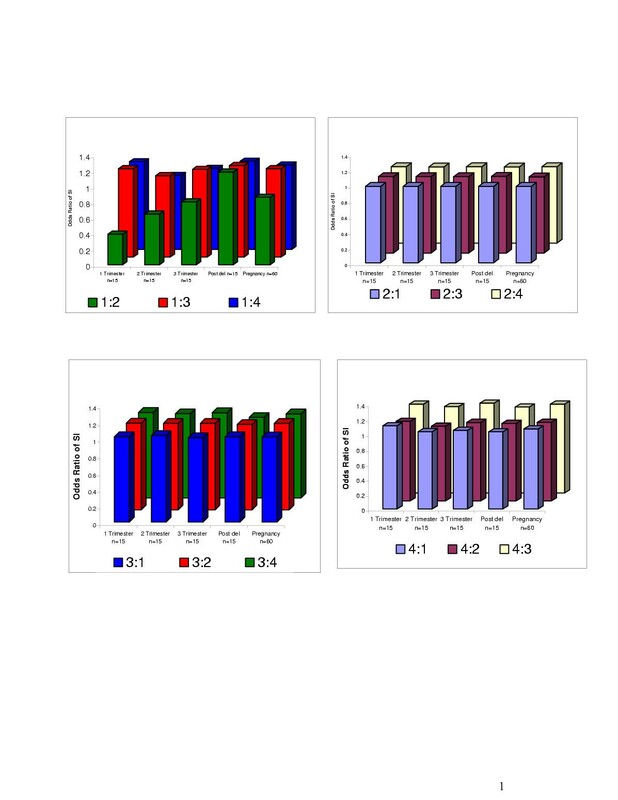 When logistic regression analysis was carried on the SI values for different combinations of each set of mixed lymphocyte reaction experiment (Figure 1) these results were further confirmed. It can be observed that the odds of greatest blocking activity happen to be in the first trimester against husband's cells only. The present study clearly demonstrates that alloimmune mechanisms may play a protective role by blocking the effect of maternal lymphocytes against an alien trophoblast. The MLR-Bf may camouflage the HLA antigen on the foetus, there by blocking the afferent limb of the maternal immunological response. The relative absence of these factors (APCA and MLR-Bf) in patients with RSA in our study emphasizes their role in the maintenance of normal pregnancy. This was further confirmed by ANOVA and logistic regression analysis, which indicated that MLR-Bf was directed only against husband's cells. Thus, these markers should not be disregarded or abandoned altogether while considering the role of other humoral factors. This study was supported by a research grant-in-aid from the Indian Council of Medical Research (ICMR), Govt. of India. SA drafted and planned the study. MKP carried out all of the experiments. LCM performed the sequence alignment experiments. SKM carried out the statistical analysis of the results. SSA conceived the study and participated in its design and coordination.